Here at Shoot we endeavour to keep a watchful eye over the emerging talents in world football and keep you in the know in terms of who you should be tracking in the years to come. Following our last edition on Wolverhampton Wanderers midfielder Morgan Gibbs-White, this time we take a look at Norwich City’s teenage full-back Max Aarons. After moving from Luton Town to Norwich’s academy in 2016, Aarons spent two years in the club’s youth set-up before breaking into the first-team during the pre-season of this campaign. The 19-year-old was handed his debut for the Canaries in the Carabao Cup back in August against Premier League Cardiff City and made an instant impact by scoring the third goal in a 3-1 win. He was then given his league debut five days later in none other than the East Anglian derby, away at Portman Road. But such an occasion would not faze Aarons, who linked up well with Emi Buendia on the right hand side and was not frightened of pushing forward when possible. So impressed was manager Daniel Farke with the young man, that Aarons has gone on to play every league game since. His performances led to a call-up to Keith Downing’s England Under-19s side, which paved the way for another debut – this time in a 2-1 win over Belgium. The exciting prospect has not only shown the defensive maturity of a player beyond his years, but also exhibited a desirable trait for modern full backs – the ability to chip in with goals. 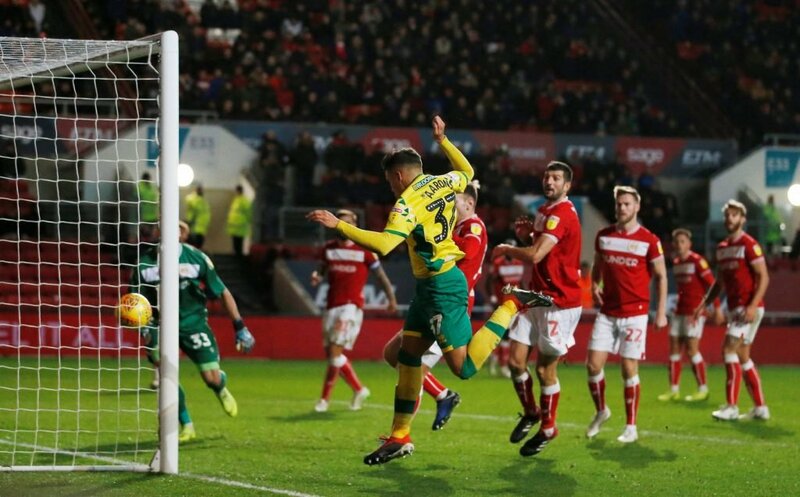 At the start of December, Aarons scored his first league goal for the club against Rotherham after a perfectly timed run allowed him to head a chipped cross past the goalkeeper. The former Luton Town man’s offensive capabilities were once again on full show later on in the month at Ashton Gate, where a back post header salvaged a draw away to Bristol City. Aarons heading home against Bristol City. As with the nature of football, good performances bring about transfer speculation – which is certainly the case for Aarons. At the end of December, it was reported that north London rivals Arsenal and Tottenham were monitoring the young Englishman, who is said to be valued at £15million by the Canaries. Aarons – who is the cousin of Newcastle United winger Rolando Aarons – signed a new contract in October to keep him at the club until 2023, but should he continue to progress at his current rate, there is a sense of inevitability that he could outgrow Norwich. But with just 23 Championship appearances to his name, the 19-year-old needs to keep his feet firmly on the ground in order to live up to his undoubted potential.